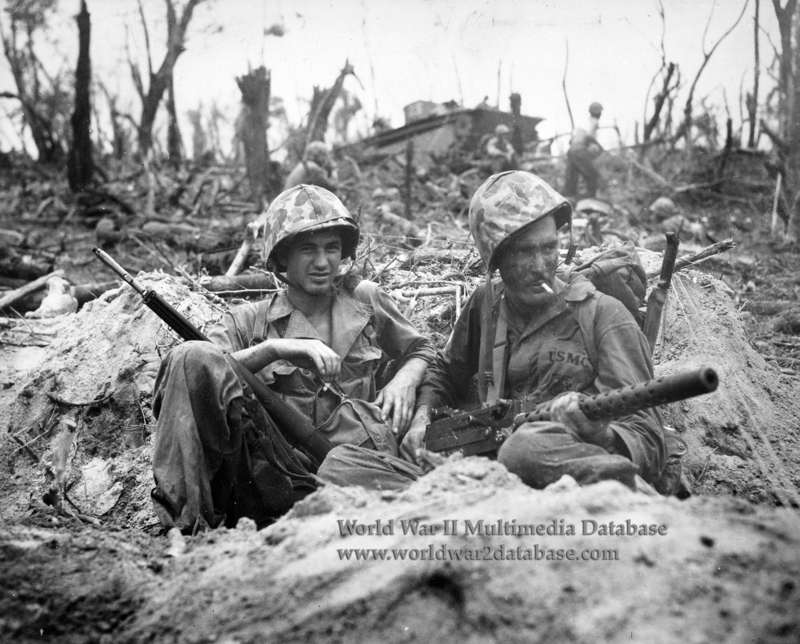 1st Marine Division Private First Class Gerald P. Thursby (December 9, 1920 - July 19, 1999) of Akron, Ohio and Private First Class Douglas D. Lightheart (September 13, 1920 - November 10, 2006) of Jackson, Michigan, enjoy a cigarette during the initial hours of the landings on Peleliu behind White Beach Two. LVT(A)1 Amtrac A-5 of the 3rd Amphibious Tractor Battalion's A Company has bellied up against a log; eventually this Amtrac would later reach the airfield. Lightheart, a veteran of Guadalcanal and Cape Gloucester attached to the 7th Marine Regiment, landed in the 1st Marines area and after encountering dead Marines on the beach, he saw his Amtrac's tailgate blow thirty feet into the air from a mortar hit. Lightheart had stopped for a smoke when Thursby arrived; Marine photographer Sergeant Henry H. Clements (September 2, 1923 - March 31, 1969) asked to take their photograph. None of the men knew each other, and they would never speak again. Lightheart would be wounded in the head and face a day later. Clements was wounded during the war as well. Thursby, a veteran of Guadalcanal and Cape Gloucester, survived the battle unscathed. Lightheart was a postal worker after the war and Thursby painted advertising signs before working at Wilkinson Sheet Metal in Akron.